ESL Made Easy: 5 Compelling Reasons to Use News in Your ESL Class! 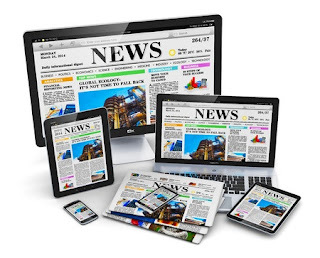 5 Compelling Reasons to Use News in Your ESL Class! By ESL MADE EASY - If you’re teaching English as a Second Language, using standard textbooks can get tiring after a while. Students may see the scenarios you ask them to discuss as contrived or not representative of real life language applications, and teachers often get bored using the same lessons over and over. However, there’s one source of material that will never run dry, and that’s current events. With so much happening in the world around us, there’s very little reason to use the discussion sections in printed textbooks to strengthen your students’ conversational skills. Need more convincing? Here are five compelling reasons to use the news as a teaching tool in an ESL class. 1. The newspaper is an authentic text. Unlike the awkward scenarios in most textbooks, the news is real (forget the biases) — it's authentic. Students can actually take what they learn in class and have an actual conversation, in English, with friends, family, acquaintances, and co-workers about the same subjects. 2. It helps students build vocabulary and learn idioms. There are some words that come up frequently in current news articles and nowhere else. By using the news to teach, students can learn these words. Also, as students learn idioms that are used in reporting and in everyday conversation, they’ll feel more and more comfortable with the language. 3. It helps students learn what is going on in their new country. Many English learners are new to Canada and therefore may not be familiar with the country’s current hot button issues, key figures, or political climate. Using the news as a teaching tool in class not only helps your students the language — it teaches them important nuances about their new home. 4. It gets students in the habit of keeping up with the news. Once students are comfortable picking up an English language newspaper or watching an English language news broadcast, they’re more likely to continue the practice long after your class is done. This is a great habit for them to get into - they might learn to paraphrase all the crazy hoopla that's been happening with the US election coverage on CNN too! 5. It makes your job more interesting! The news is always changing, which means that there’s always something new to talk about in class. And while it’s true that you won’t be able to rely on last term’s class prep to get you through your current class, your new lessons will take the monotony out of teaching the same material from one term to the next, and it will help you grow as a teacher. Using newspapers and news broadcasts in your ESL class as a teaching tool is an idea that you should consider if you haven't already been doing it. You and your students will reap the benefits mentioned above, and you’ll find yourself becoming much more knowledgeable about what’s going on in the world around you. FIND YOUR UP TO DATE ESL FRIENDLY NEWS STORIES HERE OR TRY ESL ONLINE NEWS SITES WITH PLENTY OF FOLLOW UP ACTIVITIES HERE! Wonderful post, I loved to read this, I got lots of things to learn here. Yes...there is always so much to learn in this field! Thank you and happy you found this post useful!